Having tiles in your entrance way is a very practical option for busy family homes. But if you pick a fabulous patterned tile it can also create a bold first impression to guests and give a hint of the rest of the interior style of your home. 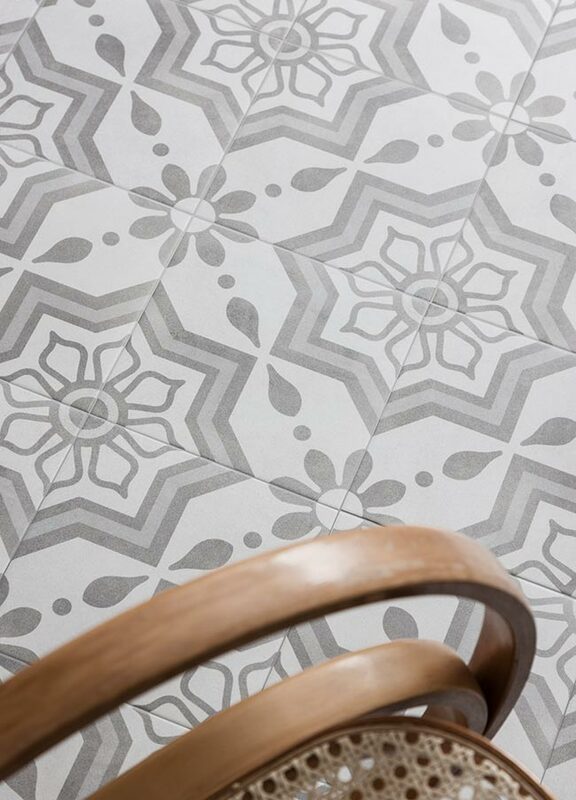 Patterned tiles don’t have to feel old world or traditional. 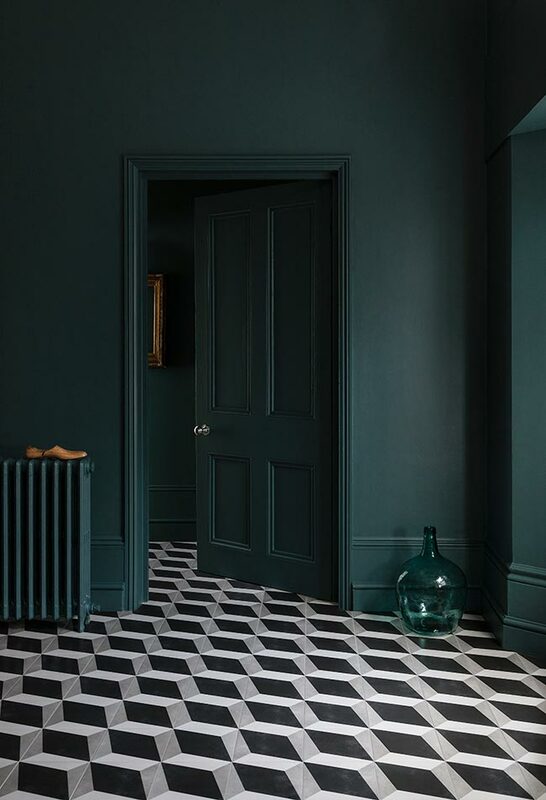 This modern space has painted moss green walls, woodwork and doors – and then black and white patterned tiles on the floor in an edgy graphic design - all of which I guarantee will make a strong visual statement in your home. 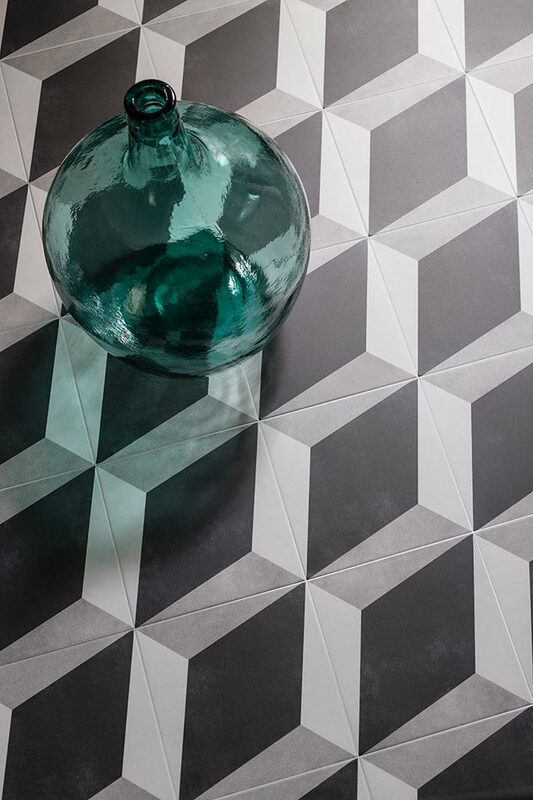 For smaller hallways pick a bold 3-D effect tile (as above with the Cuban Black Block Tile). The appearance of the tile tricks the eye into making the space appear bigger – ideal for narrow entrance ways. In my own home, I tiled the risers of my stairs in small mosaic patterned tiles. The mosaic tiles were easy to apply and needed no cutting – and to stop this from looking too ‘fussy’ I made sure I choose a grey patterned tile and painted the woodwork in grey shade to match the tones of the tiles. If you’re looking for a little inspiration, head over to my blog and take a look at my makeover posts! 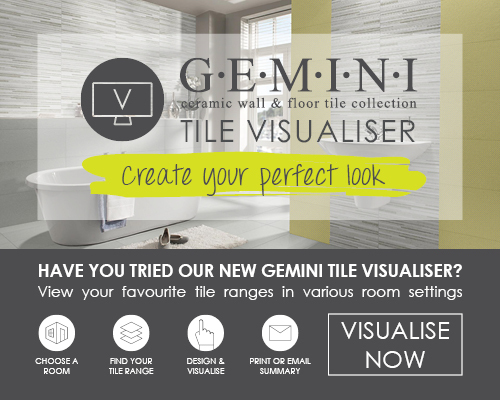 STYLE TRICK: If you are not keen to tile the whole of your space – then why not try an inlaid tile ‘rug’ – where you tile a section of your floor in patterned tiles with a border of plain tiles – to create the look of a rug on your floor. Something you don't see a lot of the UK is patterned tiles in bedrooms. 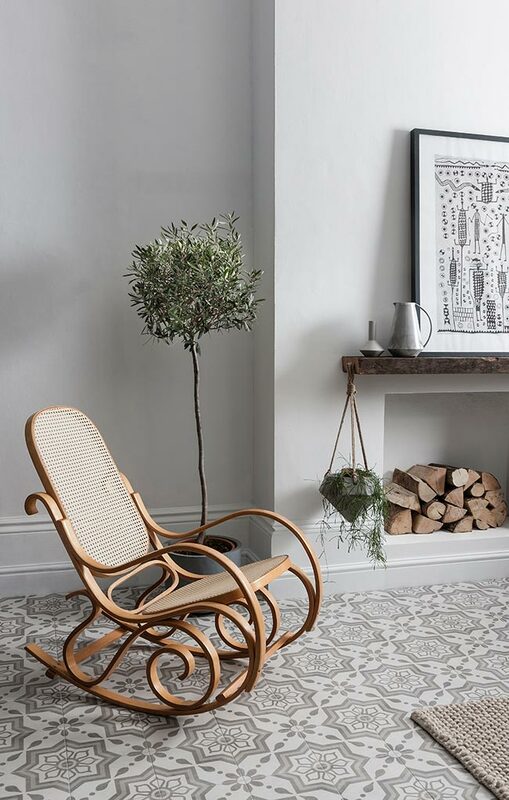 It’s very common in places like southern Europe and Morocco where tile floors retain the evening coolness throughout the day and feel incredibly pleasant underfoot. Tiling your bedroom is an idea worth trying especially if you are a pattern lover – and the overall effect is really pretty too. I would advise you have underfloor heating installed to keep it feeling warm and cosy. STYLE TRICK: If you want to make your bed the statement in your room, why not make an ornately tiled headboard. Create a solid wooden frame out of MDF and then glue on tiles to give your bedroom a style inspired by Morocco. Trail plants from the top of your headboard to soften the look. A tiled pattern adds just the right amount of liveliness to a modern living space. You’ll find this design is also a practical solution for busy homes – especially if your room is open-plan. Carpet can look tired and dirty quickly in busy living spaces while patterned tiles will add vibrancy – and will look chic for longer. The age of your home will impact what tile pattern you may go for. 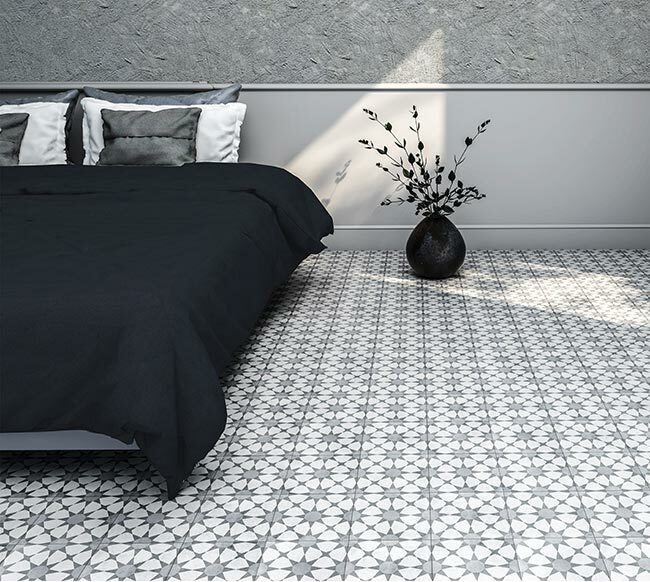 For a contemporary edge – pick a soft monochrome printed tile (Cuban White Star is my personal favourite) or for a more classic look try Cuban White Ornate which will perfectly suit period properties. Your living room fireplace is a great way to add tiles to your living space. You can tile the surround or the top of the mantle. In my own home (as my fireplace isn’t working) I was free to tile the hearth in a clashing tiled pattern to draw attention to it. It really is a showstopper and worth considering if you want to make a bit of a statement! STYLE TRICK: If your living space is open-planned with one room leading from a dining room onto a kitchen – then why not mix up your patterns? This will have the effect of ‘zoning’ your space. 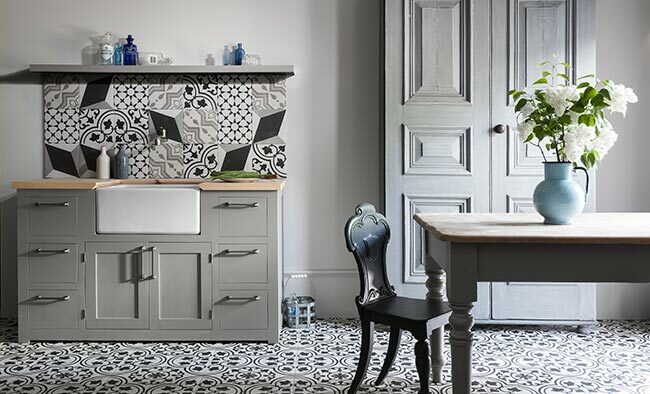 Stick to one colour palette in your tiling but play with the scale of the patterns or repeat on your tiles – mixing up large bold prints with smaller repeating patterns. If you’re looking to inject colour and personality into your home, then I hope these tips have inspired you to be creative with patterned tiles. A perfectly placed patterned tile might be just the thing your home needs - and it’s so worth the splurge. 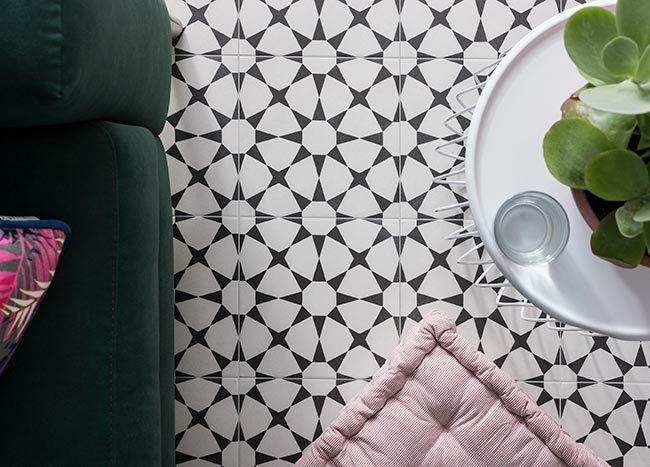 There you go – there’s Maxine’s top tips on how to work the pattern tile trend into every corner of your home.